Located in the Heart of Mid-Missouri, 97 Sites, 63 Pull Thrus - Full Hookups, free WiFi, restrooms, showers, store & gift shop, rec room, meeting room, LP gas & more. Come as strangers, leave as friends! This is our second time around here and the trees are in full bloom again. Very beautiful, in fact this is a very pretty park with paved roads (entrance much better now) with pretty level gravel sites. You can go online and reserve a particular site if you like. Again. sites are pretty narrow but long enough, we didn't disconnect. Wifi was not as good this year, maybe because we were in a different site this time.. People are very friendly and help you to your site. Wish they had cable as that would make it very nice indeed. Access off I-70 is exit 128A and then bear to the left as you keep on us 63 .North. We will most likely come back again. This is our 3rd time here with a 30' 5th wheel. We only stayed one night each time. Pulling in it looks very inviting and clean. The staff was welcoming and friendly. Once checked in and pulling around the office to the sites the roads are a bit narrow and sites are pretty tight but no problem maneuvering. They are long enough to stay hooked up. We didn't use the restrooms so no knowledge of them. The area is clean and well landscaped but it just feels a bit crowded. Every time here it appeared mostly full so reservations are a good idea. It's next to the fairgrounds so I imagine that it would be full when events are there. It's convenient to groceries to re-stock food and necessities. When passing through the area I'm sure we'll stay here again. Great location!! Staff is courteous and friendly. I will stay there every time I go through central Missouri. A very nice park just north of Columbia, MO. Just off Rte 63 a couple of mile north of I-70. The sites are somewhat close but nicely laid out and plenty of landscaping. There is a pool and playground. Just a mile back into Columbia where there are plenty of grocery stores and restaurants. Very pretty rv park especially when we were there with all the pear trees in bloom. The only reason I gave it a 4 was because the sites are very narrow. You are very close to your neighbors but the sites are very clean, well kept and the entire park is well maintained. The restrooms were great and the staff very friendly. There are some places in the asphalt road that need repair but owner said they are trying to work on that. It is off I-70 on exit 128A and that is a little tricky getting onto Hwy 63 but just watch for the signs or listen to your gps. It seems that they are full most of the time so reservations are suggested. We would stay again and I would recommend it for a short stay or overnight as you are travelling i-70. The wifi was very good, only suggestion is for cable tv. Air tv channels were ok, we got about 15. The office staff was very pleasant and helpful. The grounds were nicely decorated with lots of green areas. Bathhouse was clean and showers were hot. Good wifi. Would stay again. There is a field you can access from the campround, which we used to walk our dogs. Thank you so much for staying with us! We are so happy that you found our staff-friendly, our rest rooms clean and our grounds well taken care of during your visit. Our staff puts a lot of love into the park to make it enjoyable for our guests and it means so much to us to hear that our hard work was recognized. We are delighted that you enjoyed your stay and we can't wait to welcome you back again! This is probably the fourth time we have stayed at this park and it NEVER disappoints us! It is a beautiful setting, with great care taken to offer flowers, plants, and beauty. The staff is incredible - always willing to help the campers in any way, the store is filled with great and practical food and gift items. We love it here, you will too!!!!! Thank you so much for staying with us, we are so glad to hear that you enjoyed your stay!! We are honored to receive such kind comments on our staff and our park grounds and we want to express how much your review means to us. We look forward to welcoming you back again and again! Just stayed one night on way back home, but will remember it for future road trips. Nice size, clean, everything was really nice. Thank you so much for staying with us! We truly appreciate your feedback and we are so happy to hear that you had a great experience while staying in our park on your way through the area. We look forward to welcoming you back again in the future! We wish you safe and happy travels! We made our reservations on line thru camp native. When we arrived we were notified that we would not get our Good Sam discount. We were told they are working on it and that was all they said. I plan on contacting Good Sam about their guaranteed discount. They directed us to our campsite and it was short with hardly any room to park the truck after we were unhooked. We were staying only two nights so no big deal, I would deal with that. How ever it was so narrow, six inches from the electrical outlet on the slide out side to the other side we couldn't let out canopy out to the full extension. There was a wifi pole in the way.It was a little muddy but we weren't going to spend much time at the campsite anyway. Little did I know thaqt the next day, when we were going to leave, it had started to rain early in the morning. That happens when you are camping, but what shouldn't happen after we got done with breakfast is five inches of water on one side of the camper and three inches on the other side. I couldn't get close to the camper to dump our tanks or hook up to the camper without wading thru the water. My wife and I both had soaked feet by the time we got hooked up.After we left she called Cottenwood rv to let them know what kind of problems we had with the water and all she got was "you should have called and we would have helped you. My jaws were so tight by then I didn't want to talk to them. If they have people standing around ready to get hooked up, they should have people available to grade the campsite so there is no water problem. For what they have to offer I think the campground is over priced and a bad reflection on the Good Sam affiliation. I can't recommend this RV park and don't plan on returning at all!!!! We stayed 1 night to visit the Budweiser Clydesdale ranch. The park is a short drive from I-70 on US-63 to Brown School Rd exit. Then along a narrow paved 2 lane rural road to the park which places the park in a peaceful, rural setting. The interior roads are paved but showing their age as the asphalt is cracking making for a rough ride in some places. The roads are very narrow and the turns are tight making maneuvering through the park a challenge. The sites are a mixture of P/T’s and back ins. The parking surface is gravel and for the most park level. The longer P/T sites (site 84 – 97) were long enough to leave the toad connected. They have full hook ups – water, electricity (50/30/20 AMP), & sewer. The utility connections were generally about mid site. The sewer connection was at the ground so it was easy to establish a downhill flow. Sites had sufficient room for opening slides. Distance and grassy areas establish privacy between the sites. There was an outside table or fire pits. There are trees scattered throughout the park which could pose an obstruction to the sky so satellite reception is dependent upon site assignment and dish configuration. Didn’t try to receive any broadcast channels. No mention of cable TV provided in the park brochure. The park provided WiFi was adequate. Our Verizon WiFi hotspot worked well. Didn’t try the NET10 phone so don’t know about cell phone reception. There was no designated fenced pet area but there were a couple of designated grassy pet areas around the park. Plus there was sufficient space along the park’s roads to exercise a dog. There were bag dispensers and collection stations for waste around in the park as well as some garbage cans scattered around the park. For being in a hazardous/severe weather area, didn’t see an underground storm shelter or any structure identified as a severe weather shelter. We would probably stay here again if visiting the area but only in one of the long P/T sites. TIP: We arrived early enough to get settled in so that we could take the afternoon tour at the Clydesdale Ranch. It took about 30 minutes to get from the park to the ranch. The ranch tour is by reservation only. Tours tend to fill up quickly. The park fills up on weekends when the college football team has home games. Thank you for your review. We truly appreciate your feedback! We are looking forward to upgrading our roads with new surfacing this year. Thank you for mentioning severe weather options in the area, while we do not offer an underground shelter, we do offer shelter in our restrooms and laundry rooms which are protected by 3 foot reinforced steel. Our shelter areas are marked with green shelter signs directing our guests where to go in the event of severe weather. We hope you will stay with us again in the future, we look forward to providing the best experience possible. Thank you again for your review and we wish you safe and happy travels! Very pretty campground, well maintained, in front of a large UPS facility. Sites are narrow-ish, but this time of year with a number of empty sites, it didn't really matter. Check in was easy, and a worker guided us to our site. Cottonwood is a smaller campground, something we like, and people seemed rather friendly. Was easy to find off the highway. Thank you so much for your review. We appreciate your feedback and we are glad to hear you enjoyed your stay. The facility you see back on the land behind us is actually the county fairgrounds. Currently, the fair is not held there and UPS was using a small portion of the grounds temporarily during their busiest season. We are happy to hear that you enjoyed the additional help with pulling into your site. The gentleman who helped you is named Mark, he is one of our friendly owners. He enjoys meeting our guest and making sure that he can do anything to help make each stay an enjoyable one for our guests. :) We truly appreciate your business and we hope to see you again in the near future! Spent 3 nights at Cottonwoods going to and returning from Colorado. Reservations were completed and honored. The park is under new ownership and recently added WIFI was most responsive anywhere on our trip. Thank you so much for your review! We truly appreciate the feedback. We're excited to hear that our WIFI upgrade is working for our guests. We are so happy to hear that you enjoyed your stay and we look forward to seeing you again in the future. Wishing you safe and happy travels! Stopped here for one night while traveling through. The facility looked amazing. The sites are small but they are superbly maintained. Level pull through parking, lush grass, flowers at each site, cemented table area, and chiminea instead of a fire pit. Only $40.00 for the night. Will make sure to remember this spot whenever passing through again. Thank you so much for staying with us! We are pleased to hear that you had a great experience at our park and we hope you will visit us again in the near future. We wish you safe and happy travels! We are frequent visitors for Mizzou games.. Friendly and helpful staff as well as an inviting and clean environment, but the internet that is advertised never works. They keep saying that they are working on it when we come to stay, but it never is finished. It's too bad, because it's a great place but they don't deliver what is advertised and they haven't fixed it like they say they have been for months in the times we've stayed. Thank you so much for taking the time to review our park. Your input, and the feedback from all of our guests is very important to us and we always want guest expectations to be met upon arrival. We apologize for the trouble with our free WIFI service during your stay in August, we began upgrading in June and our upgrade took longer than expected to install, so it wasn't completely finished until mid-September. We are happy to report that the upgrade was completed and our WIFI signal is stronger and level and works wonderfully throughout the park now. We look forward to you being able to retry our WIFI service during your next stay. We truly appreciate your feedback and we look forward to seeing you again soon! We wish you safe and happy travels! 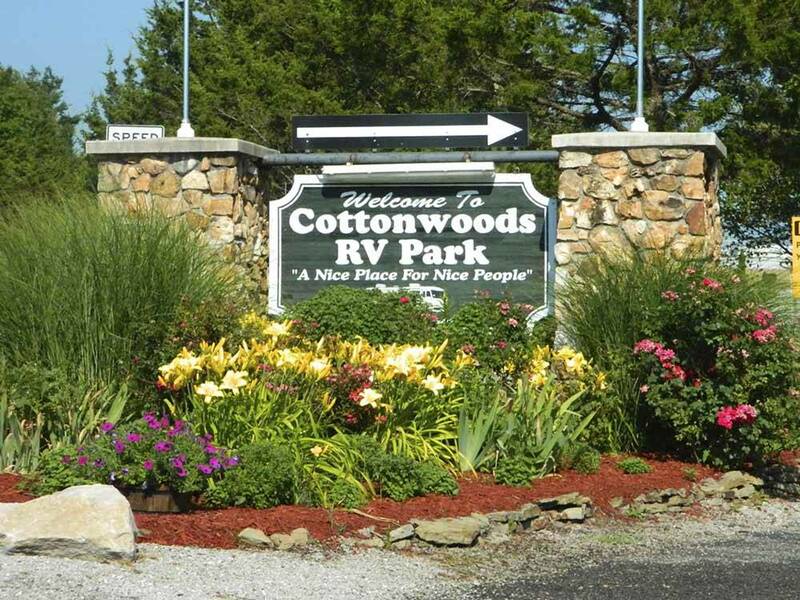 This is a great RV Park, there is a lot that can be said...with one caveat. This is a large park that is clean and neat. It is being maintained constantly. Check-in was easy at a very nice store/gift shop/ office. They actually had a lot of products in stock, both food and camping supplies as well as souvenirs and gift items. We were able to buy milk!! The grounds are manicured with a lot of flowering shrubs and plenty of shade trees. There is a large covered picnic pavilion with a big, big fire pit and lots of tables and grills. There is a pool that is clean and looked very inviting, though we didn't try it. Also a children's playground that looked new. Nearby was a very nice wooden gazebo for just relaxing out of the sun and enjoying the flowers. Each site has a picnic table and the front row sites each have a chimenea, but open fire pit fires are not allowed. There is also a rally room and one of the nicest "Rec" rooms I have encountered with real exercise equipment, book and dvd exchange, and tables and chairs for just getting together. The bathrooms are clean and well appointed, the showers were hot, though I believe the shower enclosures needed some scrubbing...probably hard water. Basins, mirrors and counter tops were all squeaky clean. The "Heads-Up" for this campground: the roads are narrow,and the sites are tight, making for very shallow turns. Get the walkie-talkies you use for back-ins and send your navigator out to help you pull into your site. Even the Old Pros who have pulled into thousands of campsites, should send someone out to watch. Large RV combinations definitely need extra help. Someone from the office will also help. The park enforces overflow parking, the roads are as clear as possible, just not wide and decorative shrubs and boulders edge the site entrance and exit. Drive careful and enjoy this wonderful oasis off the road. Relax! Thank you so much for staying with us! We appreciate your kind review and we look forward to seeing you again in the future. We wish you safe & happy travels! The grounds were well-maintained and lots of flowers in bloom. The restrooms were very clean and the staff very friendly. The only downside, The hook ups for the next site were right next to your picnic table/slab. Fortunately we did not have anyone there. Also my ankles have a couple dozen bites and it wasn't mosquitoes. I noticed it walking the dogs. Next time I'll wear socks! All and all it was nice. Thank you so much for staying with us! We appreciate your feedback. We are delighted to hear that you enjoyed your stay and we look forward to seeing you again in the future! We stayed 1 night as we were having work done on our vehicle that we tow our travel trailer with. After setting up left for hr when returned a paper was stuck to our door as well on a lot of other campers stating in very unfriendly terms that dogs off leash or not cleaned up after would require a penalty for you to leave. We hadn't even set foot out the door. Bathrooms although clean full of signs. We travel 5 months and never have I heard of no drying hair in bathroom. The row of sites we were on is almost empty has been, which is nice as very close. Upon calling dealership they are taking longer to fix car by a few hours. Check out is noon, we informed them of our predicament and they told us a $1 per hour charge over checkout time. Not the money, but total lack of caring. I would probably shop around next time and avoid this stop. It makes a difference if run by owners or just managed by help. Thank you for the wonderful review. We appreciate your opinion and it helps us to address any issues we may need to resolve. We apologize that the Pet Clean Up Notice came across as unfriendly. Since some of our guests don't notify us of pets traveling with them, we are unable to put notices only on pet owner doors so any notices posted in the park are posted to every door. If you are not a pet owner, we apologize. The notice most definitely does not apply to you if you are not a pet owner - it is only in effect to protect you and other guests from any pet issues such as animals being off leash or pet waste that was not cleaned up. If it came across as unfriendly, we certainly apologize. We love all of our guests in the park and we want to make sure that everyone has a safe, clean, and great time while staying with us. We really appreciate your feedback and we hope to see you again the future. We wish you safe and happy travels! Overall, a nice place to stay. The bathrooms were NOT 10 star as currently rated, only average - shower stalls very small and cramped. Park staff not very helpful with our RV mechanical problem, Very POOR wifi. Thank you so much for your feedback. We appreciate all feedback from our guests so that we can continually improve the park for our guests. We are sorry to hear that the wifi was not working very well during your stay, we have recently upgraded our wifi and we are working on finishing the install this week so we hope next time you are in the area you will stop in and check out the new and improved wifi. We're also sorry to hear that you were unable to get help with any RV trouble during your stay. While we don't do RV repairs, we do business with a local RV Repair company called Commercial Truck & RV Repair, who will come out to the park and repair your RV on site, unless it is a major repair. We keep their information on flyers and business cards in our office/store and we are always happy to help refer you to them. If you have any RV trouble in the future, please let us know and we would be happy to help. Thank you again for your review, we appreciate your stay and we hope to see you again in the future! Wishing you safe and happy travels! Thank you so much for your review. We appreciate your opinion and we value any feedback that helps us improve. Our park does offer full hookups which include electric, water, and sewer at each site. Unfortunately, cable stops 500 feet from our park and despite our request for expansion so that we would be able to provide cable to our guests, we are still unable to offer cable at this time. We do however off Free Wifi and we have laundry, restrooms, showers, a rec room with gym equipment and a DVD and Book Library, as well as a pool and social activities on site for our guests. Thank you again for your feedback. We wish you safe and happy travels! We stayed at Cottonwoods 5 nights while in town for the SEC swim dive championship meet. This place is very convenient to campus which is exactly what we needed since we made two trips a day. The bathrooms/showers were very clean and the whole area is very well kept. Staff was very friendly, site were well maintained and pretty much level. My biggest complaint (2 stars on Appeal Rating) is the sites are way too close together for my liking. They have a concrete slab with a picnic table at each site. Your camper is next to one side of the slab then next to the table slab are the hook-ups for the next site. A little to cozy for me. The also seem to cater this time of year (Feb) to people staying longer term. Sever campsite with multiple cars, and large external propane tanks. Thank you so much for your great review. We appreciate your feedback which helps us continually improve. We understand about the site proximity being close for our guests. Cottonwoods was built 23 years ago and changed ownership in January 2016. We are learning that sites will need to be expanded and updated to accommodate our guests' expanding RVs. We are hard at work on a plan for expansion in the future! Thank you again for your feedback. We wish you safe and happy travels and we look forward to seeing you again soon! Cottonwood is a very nice, safe, and clean park. Owners and staff are very nice and helpful. The bathroom and showers are very nice and clean. 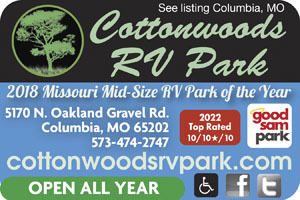 Cottonwood RV park is the best park I have stayed at in Missouri. I would highly recommend this park. Thank you for the wonderful review. We always make sure our guests have the best experience and keep coming back time and time again. Hope to see you on your next trip through! My husband and I stayed just one night here on our way across the country for Thanksgiving. I wish we had more time because this park was wonderful! The grounds were beautiful and very clean. The park was quiet and in a nice area, and easy to find as well. Although we didn't take advantage of them, they had lots of amenities. I didn't see the restrooms or showers, but I've never seen a cleaner laundry room! And the machines were the commercial variety, so you actually got clean, dry laundry at a decent price. The nightly rate was good and park management friendly and helpful. Our four-legged friend was happy as well since the park had a nice dog walking area. If we ever come this way again we would love to stay awhile and see the area. Please consider this park if nearby! Thank you so much for your kind review. We are so happy to hear that you and your pet enjoyed your stay with us. We look forward to seeing you again in the near future! Nice facility at a good location near to I-70 in Columbia, MO. We stayed two nights while enjoying biking on the KATY trail from two nearby trailheads. Bass Pro Shop is nearby. Bathroom rated a 4 simply because one of the stools was loose. Thank you for the wonderful review. We appreciate your opinion and it helps us to address any issues we may need to resolve. The toilets have been reset and anchored tightly. We look forward to your next stay with us! This park is located north of I-70 a few miles. It has lots of bells and whistles but some features -- specifically playground and restroom -- need some upgrading. Gravel sites are somewhat narrow but plenty long. Be sure to reserve ahead. They fill up fast around Mizzou activities. Thank you for your review and feedback. It is important to us so that we can make the neccessary improvements that keep our guests satisfied and coming back time and time again. This is one of the reasons we have such a large repeat business. Yes during football season we do fill up very quick, so It is important to call ahead and make reservations. Thank you and we hope to see you back soon!